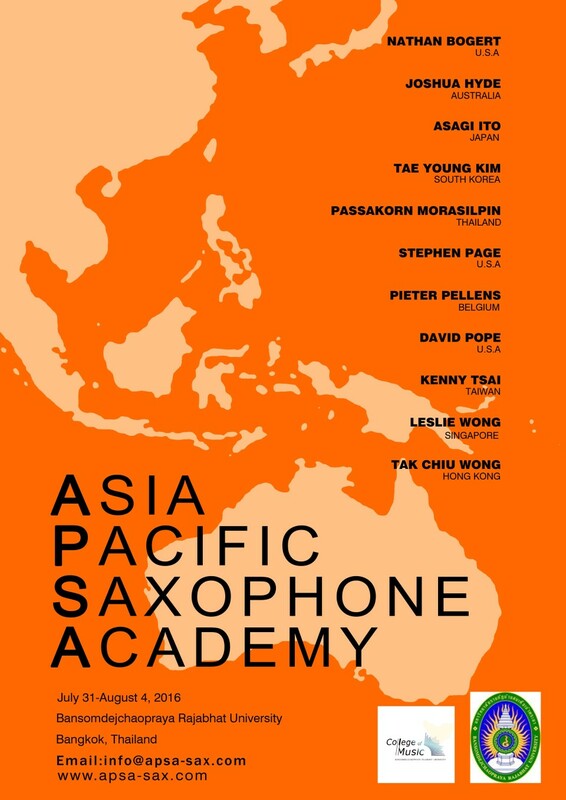 Amigo Saxophone Quartet in collaboration with the College of Music, Bansomdejchaopraya Rajabhat University brings to you the Asia Pacific Saxophone Academy 2016 in Bangkok, Thailand. For five full days on July 31-August 4, 2016, participants will be able to work closely with the faculty in a variety of settings including lessons, lectures, master classes, and ensembles. 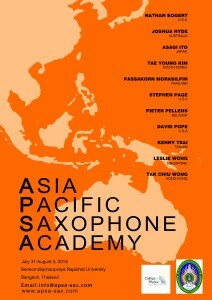 Faculty for APSA 2016 includes Joshua Hyde (Australia), Asagi Ito (Japan), Pieter Pellens (Belgium), Wong Tak Chiu (Hong Kong), Leslie Wong (NAFA, Singapore), Kenny Tsai (TNUA, Taiwan), Tae Young Kim (Seoul National University, Korea), Stephen Page (University of Texas-Austin, U.S.A.), Nathan Bogert (Ball State University, U.S.A.), David Pope (James Madison University, U.S.A.) and Passakorn Morasilpin (Thailand).